Because of my childhood–or maybe it was Marsha, Jan and Cindy–“sister,” to me, is synonymous with shared room. 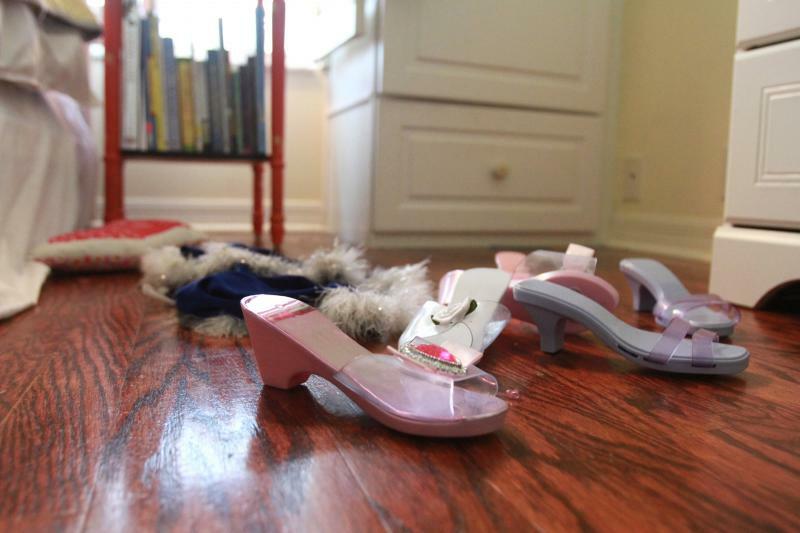 And the moment I discovered Nella would be a girl, I started planning it out in my head–the big bed they’d share, the clothes they’d fight over, the Bop and Tiger Beat magazines I’d let slide because tweens gotta be tweens. For a short irrational moment after Nella was born, I let those dreams deflate. Pardon my silliness. But of course they’ll share a room and of course they’ll fight over clothes (Just did. Purple ballerina dress. Nella won. ), and of course they’ll buy Tiger Beat because however else will they drive their mother crazy? This is the room I dreamed for them. Some stuff we made, some stuff we gathered from other places in the house, and some stuff we bought, stretching dollars as far as we could and mixing discount with a few splurges (let’s call them thoughtful investments) to create a playful, homey nook that makes us all very happy. This room was originally an office. 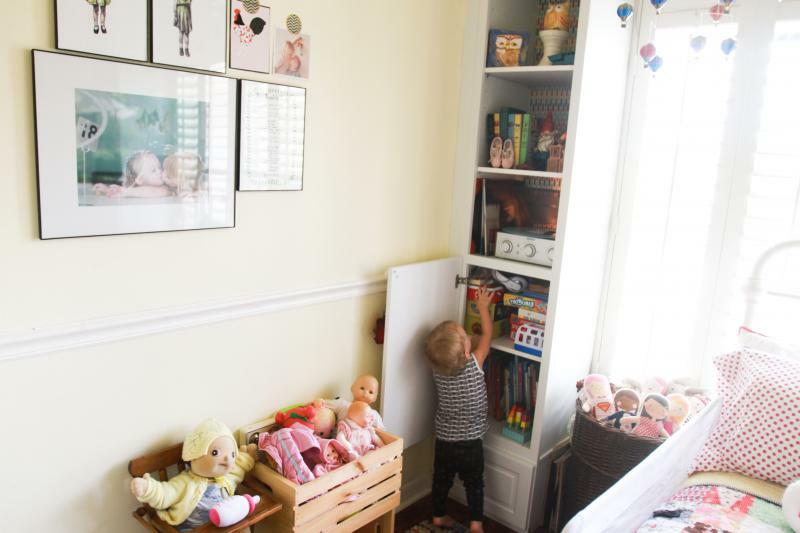 We added built-in bookshelves and a corner closet to transform it to a bedroom when I was pregnant with Lainey. The bonus is that we created a lot of great storage space, but the trade-off is that we limited our possibilities for furniture arrangement. We chose furniture carefully, opting for a discount bed frame so that we could afford my favorite thing about this room: the quilt. 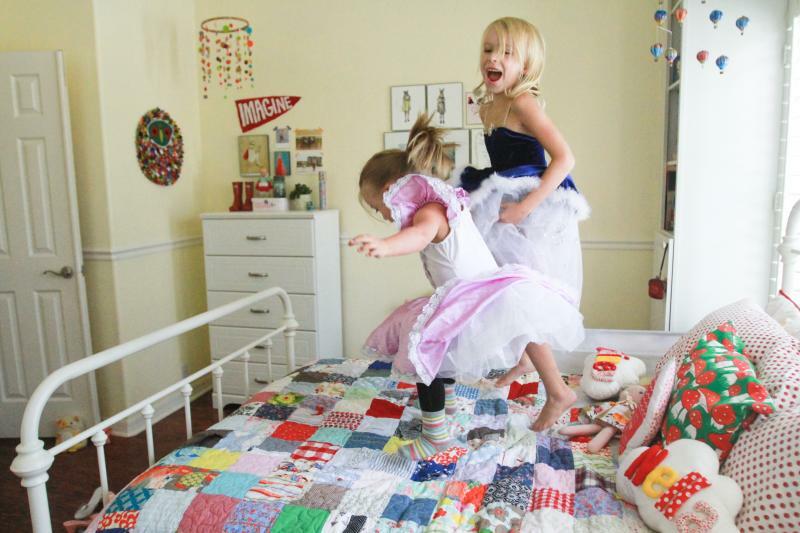 The quilt is made from seven years of baby clothes, maternity jeans, Halloween costumes, hats and nursery fabrics from all three kids. My dear friend Rebecca of Vintage Giggles designed and sewed it and included all these sweet details–pockets and buttons and straps and collars–to create a timeless gift for our family, one that’s already initiated nights of storytelling (“That square right there? That was your birthday dress. You wore that when…”). 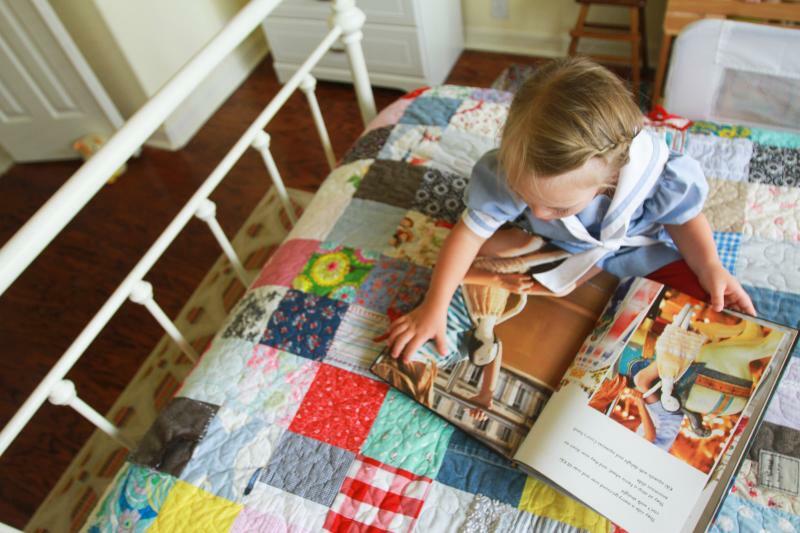 You can read the story of this quilt and find answers to more questions about it on Vintage Giggles’ blog this week. Other room details (including personalized cloud pillows which many people asked about on Instagram) can be found at the end of this post. 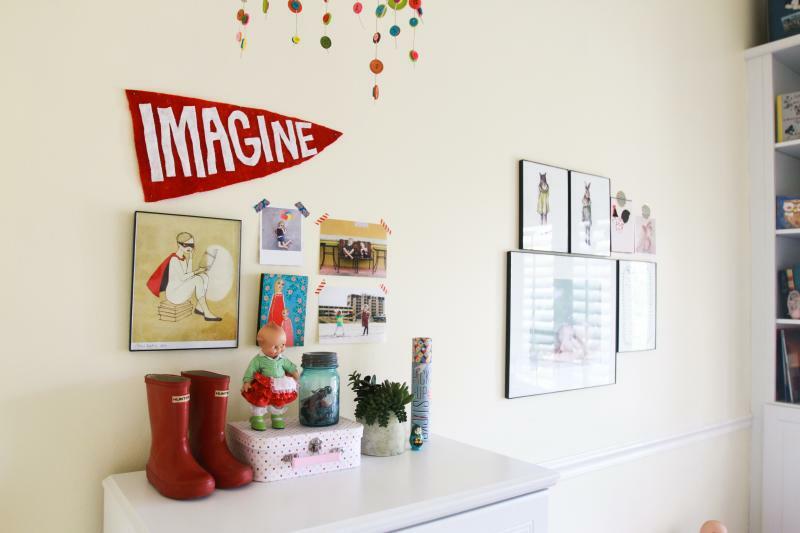 One of my favorite things about decorating kids’ rooms is that the stuff they love–the toys and dolls, the stuffed animals and book illustrations and even the things they wear like their favorite sneakers or rain boots–works great as decor and naturally adds personality and whimsy. I fell in love with these pillows as soon as I saw them–reminds me of something my sister and I would have had in our room. Except they’d be on the floor instead of the bed and covered with clothes. Look at that teeny tiny pocket on this quilt. Vintage Giggles is genious, I tell you! Music was a must-have for this room because we need accompaniment for our bed-jumping and teenybopper tunes for sleepovers and, most important, a constant stream of Carpenters and Andy Williams to go with the little twinkly tree that will be hauled in at Christmas. We opted for an inexpensive record player because there’s something fun and tactile and memory-making about picking out records and watching them spin. Plus–chipmunk voice mode is hilarious–a childhood must. 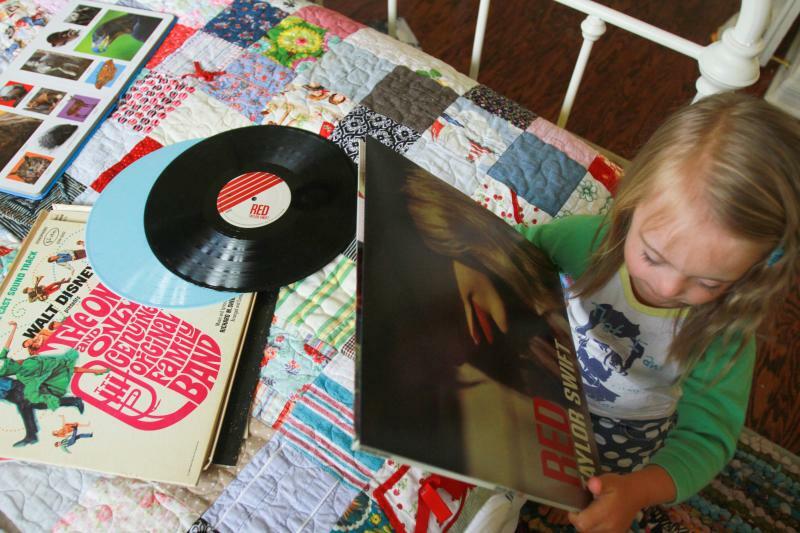 Nella likes to run the record player herself, but the stool–as you see–causes problems. “Trouble Trouble” is a favorite bedroom soundtrack. 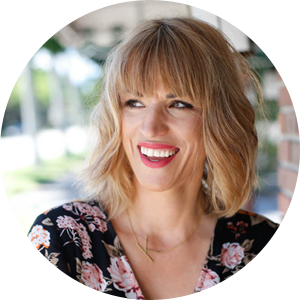 My friend Annie Flavin, who moonlights as a poet, shares my affinity for saddle shoes on kids, cozy quilts, children’s literature and getting sentimental about dreams and motherhood and making the best of life. We texted back and forth the day the girls’ bed arrived, and she knew how much I had looked forward to this sisters room thing. “Did you set the bed up yet? Send me a picture.” She shared my enthusiasm and yet remembered that this was a dream I stumbled over for a bit in the beginning. 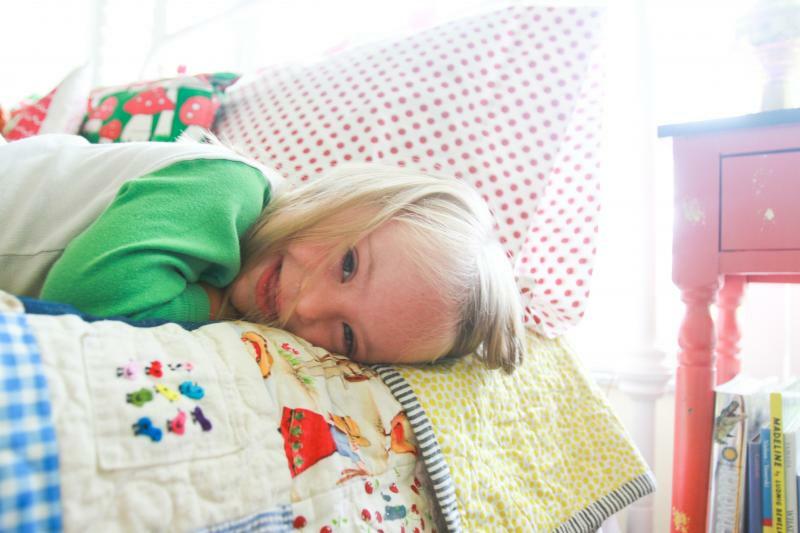 The night my girls enjoyed their first sleep in their new bed, she sent me a gift–a poem she wrote. And then our friend Tammi turned it into art, and now it’s hanging on the girls’ wall, and I couldn’t love it more. there will be one bed. there will be two girls. I thought I had imagined. I cannot wait for the memories my girls will make in this room. And, as all brothers should, Dash will squeeze in bed between them for bedtime stories and make fun of all the Taylor Swift songs they know by heart. It’s going to be fun. Tomorrow’s Grandparents Day (Hoorah, Hooray! Hugs to all the grandmas and grandpas!). 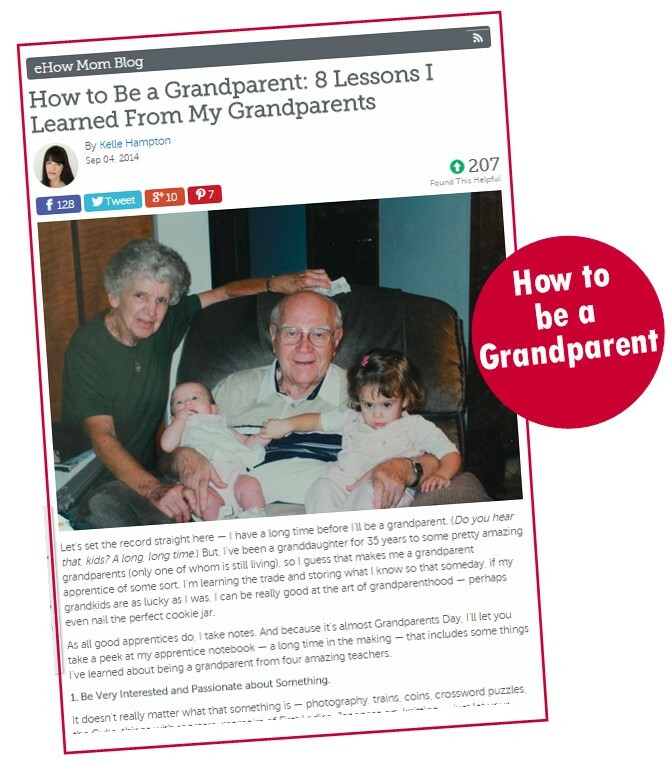 I took my research notes from watching my own grandparents and made a little guide over on eHow…How to be a Grandparent. Click below to read. So awesome!! I love their room. The personalization, the memories and for the memories in the making. Absolutely precious!! Love, love, love this. More sisters should share rooms. I always wanted a sister. Oh and yes I did have The One and Only Original Family Band album and know all the words to 76 Trombones. Beautiful job! Love the room and the happy smiles on their faces. Such a lovely room! I am sisterless but my three girls share a room … two in a lower big bed and the older in the top single bunk. I think they love it! (We have offered the older sister the option of moving but she does not want to … yet). My 8 year old daughter (who happens to have Down syndrome) just came up behind me and asked me who your girls are, how old they are … such a lovely moment! What a super fun, beautiful post. Sort of like the posts of yore. I loved it! Such an enchanting space for a magical childhood. What a beauty of a room! Soothing and majorly fun! 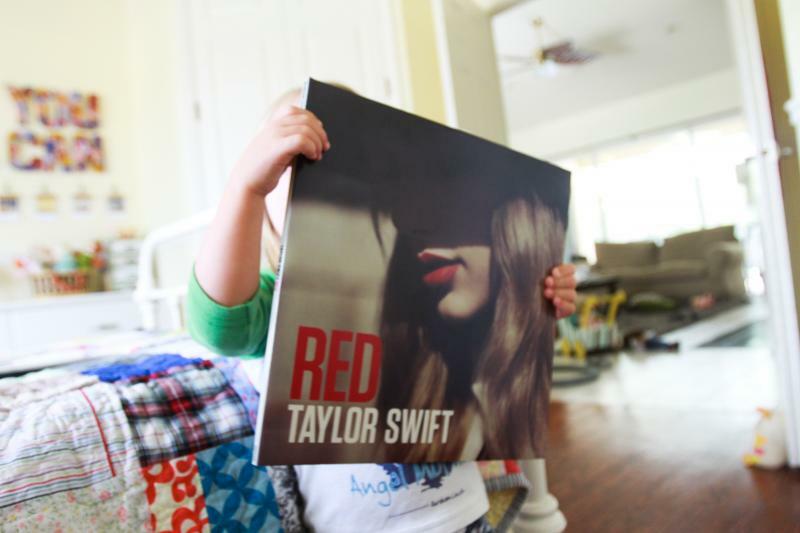 I have similar taste and already squiring away future room details for my 19 month old granddaughter. Have a similar bed in aged brass I got for a steal on Craigslist. Man, do I miss LPs! 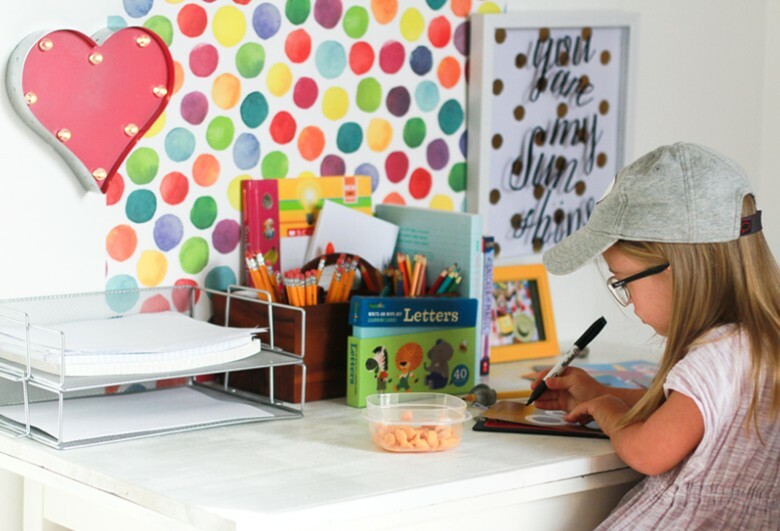 I’m into everything vintage and call my decorating style “eclectic vintage.” I’m obsessed with the magazine “Flea Market Style.” May your daughters enjoy making many a fun and memorable moment in their new room. Love it! My boys shared a bed for two years and there is nothing I loved more than peeking in on them in the night all tangled up together. This is absolutely gorgeous, who wouldn’t love this room….I know I would! I just painted my daughter’s room white & I love the colour & vibrancy that all her “stuff” provides, they give it all the colour it needs. And those cloud cushions are beautiful! I love everything about this room but my what i love tge most is that its not annoyingly over the top frilly and girly. You made me love the color red again! 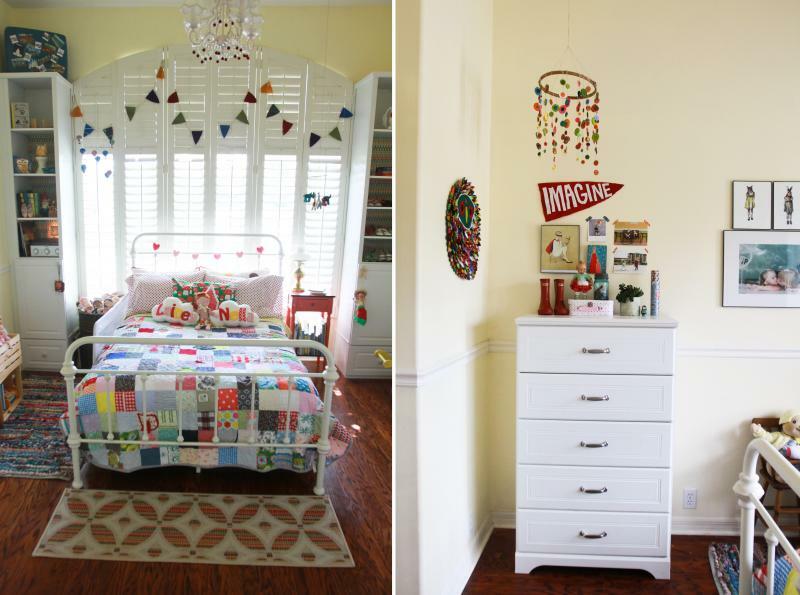 Im also obsessed with the quilt. I love how you can sit in bed and show them all the different fabrics. I have 2 boys and, like you, i dream of their future shared room. Bunk bed, buffalo check, bookshelves, and pictures of outerspace abnd whimsical foxes in human clothing. 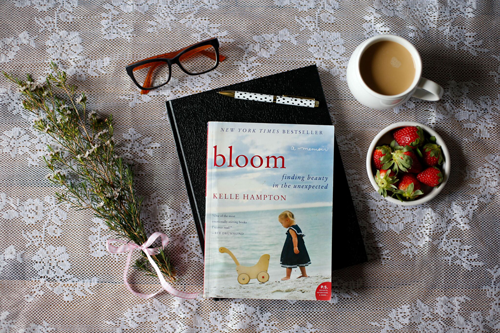 What joy just overflows from your life into your blog! I’m one of 4 sisters – not brothers – and there is something amazing how the bonds we form. I love your pics of your precious children and every single thing about the room where they will make a lifetime of memories! Just perfect! Where is Lainey’s Though she be but little, she is fierce” shirt from? We recently bought a trundle bed for our girls. 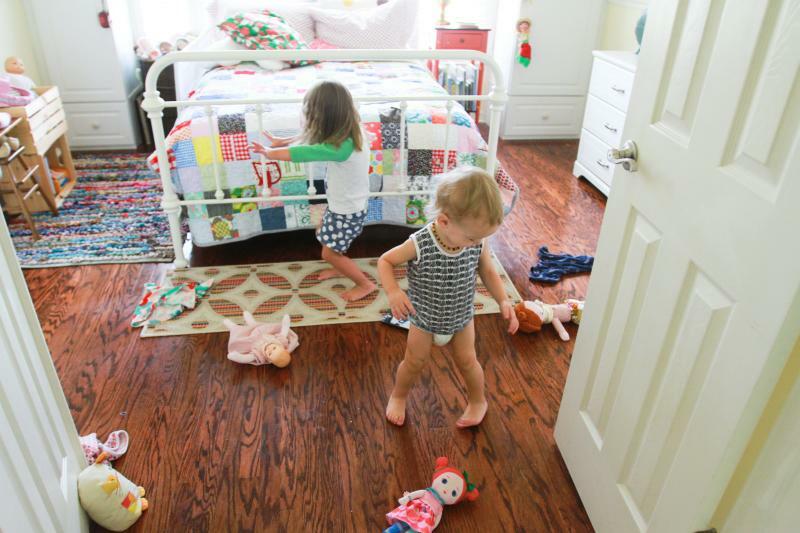 We’re going to convert the crib into a daybed in one room and make it a playroom and then the trundle bed is a great space saver for a shared room (my oldest likes that her sister sleeps ‘in a drawer’). This makes it flexible for them to share and separate either for good, or temporarily (like when one is up all night barfing or coughing and the other one just wants some peace to sleep). Wow. This is an awesome room. 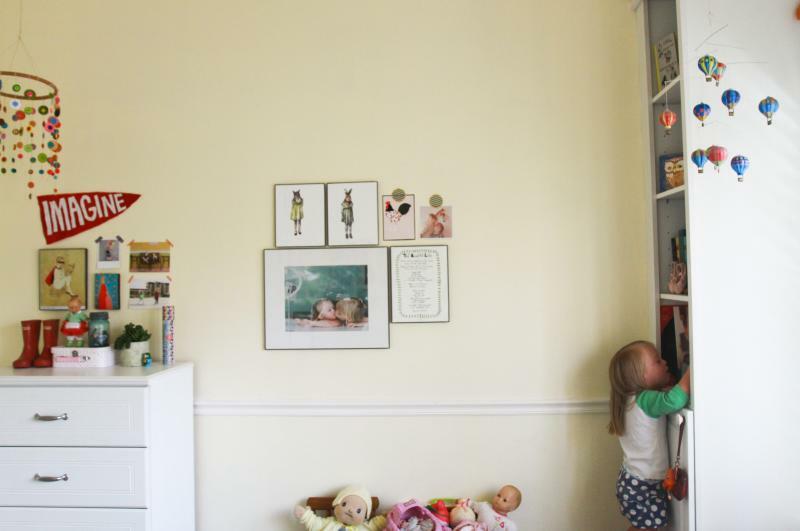 I wish I could make my girls’ room even a fraction as whimsical as this! My two share a room too. And my 3rd, my son, has his own, but my 4th – in utero – is a boy, so I suspect the boys will be sharing a room too. 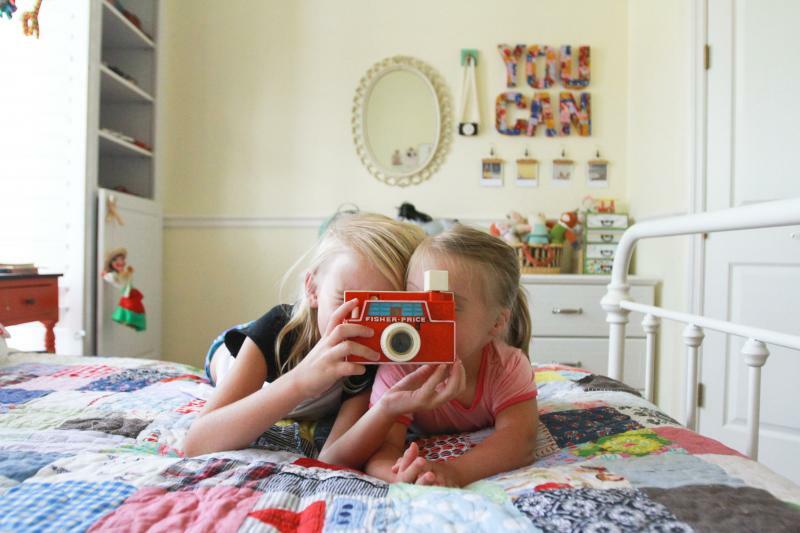 How lucky your girls are to have such a memory-filled room! 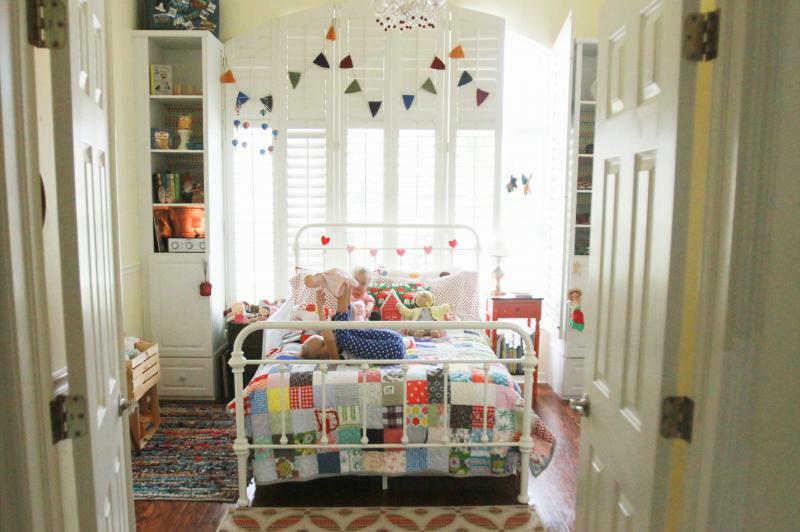 And I absolutely love that quilt idea! I need to learn how to do that! The room is just so creative and welcoming. You’re lucky your two girls get along! My younger sister and I used to fight all the time when we shared our bedroom..even in separate twin beds. It was constantly “stop messing with my stuff” or “I’m gonna tell Mom what you did!”. Finally at 13 I got my own room and it was heaven. I think Nella and Lainey will always have a very special bond and Dash will be a part of it all. I shared a room with my sister, twin beds thank heavens, I’m sure for her. My side was a tornado zone and she had to put up with my icky gold fish bowl. But this thing with each kid having their own room, poor kids! Questi bambini sono meravigliosi e il tuo modo di amarli si evince benissimo dalle fotografie che gli fai. Non sono soltanto belli, sono ancora più belli visti attraverso i tuoi occhi, tu aggiungi bellezza alla loro bellezza, se è possibilile aggiungerla a qualcosa che è già infinitamente bello. Io adoro il tuo blog. What a beautiful room you’ve created for your girls!! What color/brand of paint is that on the walls? Beautiful room. You definitely have an eye for decorating. 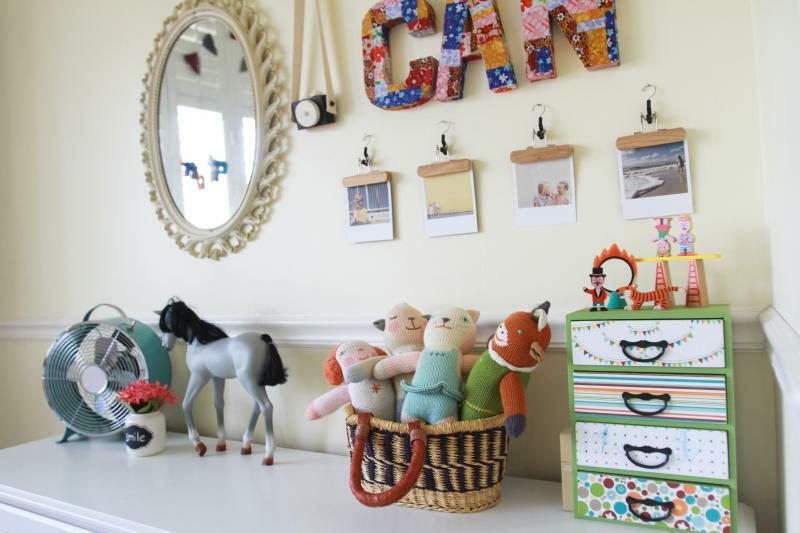 I love the little basket of stuffed animals on the dresser. It goes without saying that the quilt is the bomb! Love their new space wonderful quilt and I love they will sleep together. 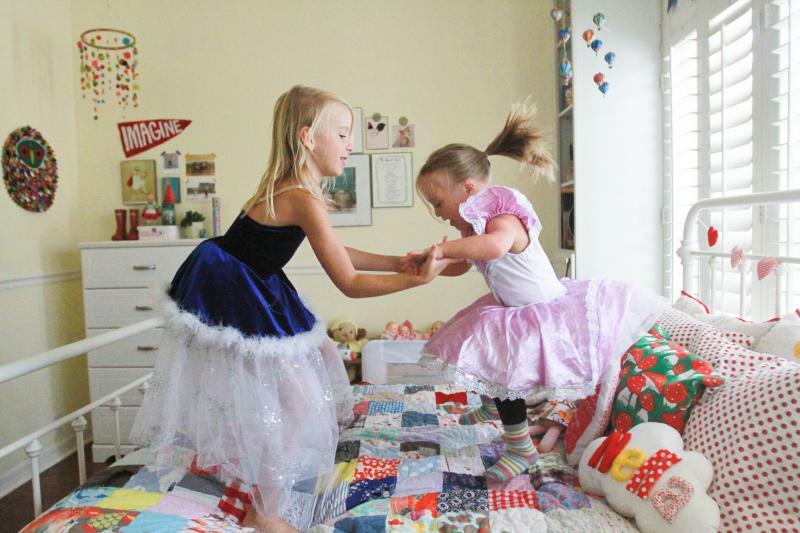 My granddaughters have separatebedrooms but sleep together in twin beds in me room. Wish I would have had a sister. I adore the bedroom, it’s definitely full of magic and whimsy and I would love to have a space like that for myself. 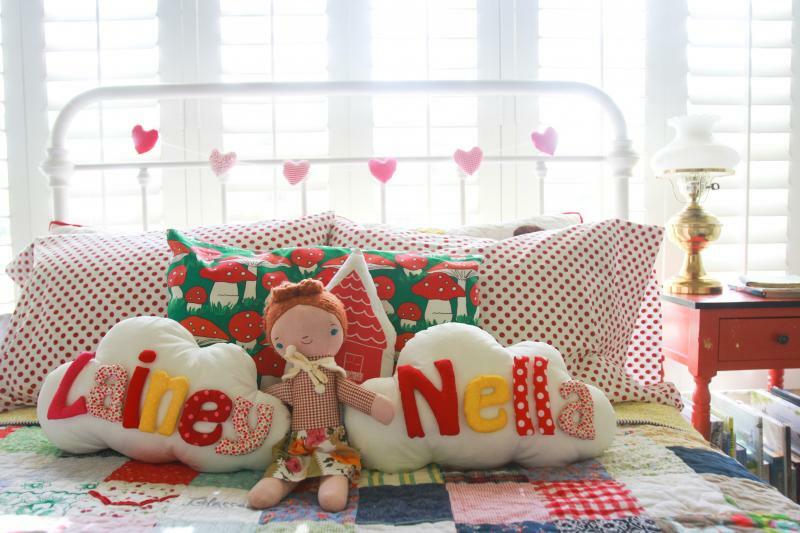 The quilt is beautiful, and those cloud pillows are adorable! The mushroom pillow reminds me of my favorite show as a kid, “The Magic Garden.” Too cute! And that lamp on the red bedside table? We’ve got at least two of those at my house, hand-me-downs from my grandparents (and great-grandparents I think too)! Awesome. And last but not least, the record player was a great idea! I still have the little kids’ record player my aunt gave to me when I was three, and it still works so I can play my growing collection of old LPs anytime I want (I love Fleetwood Mac and the Mamas & the Papas)! Enjoy your awesome room, girls! I LOVE this! That last picture is so precious! 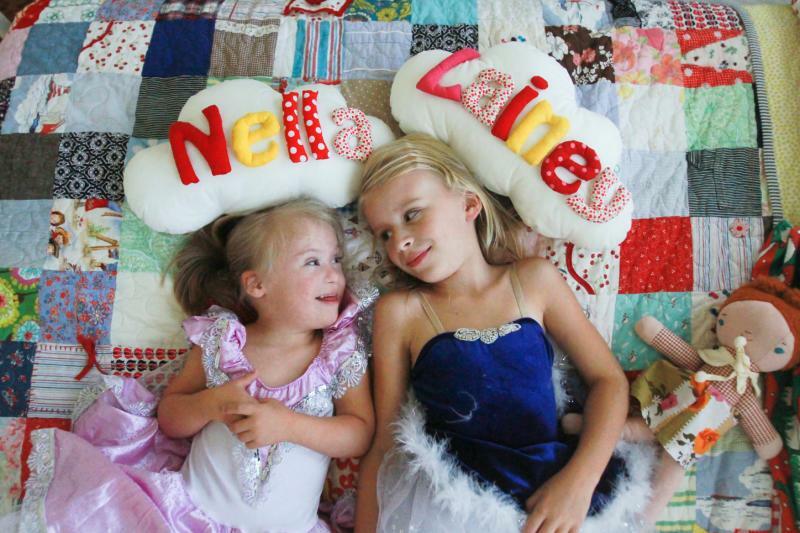 Kelle, you did a fabulous job at creating a very special “sister room” for Lainey and Nella. I love the personal touches, the details that express what your girls interests and what expresses their personalities. I have a twin sister and we shared a BIG bed and although we were very young when sharing our room I remember it the most. The steel framed bed (similar to yours), the pink quilted blanket, the knitted pillows from Grandma, the matching praying girls on the front of our door, the matching baby dolls that lined the end of our bed. Your girls will make amazing memories in their shared bedroom. Thanks for sharing. I love reading your blog!!! Oh my preciousness! I love the sharing of the bed. So very Little House on the Prairie kind of snuggly! Has it messed with their sleep habits? The poem your friend wrote is just beautiful! Love it. This room is FULL of love!! Every detail has been thought out and is so personal. 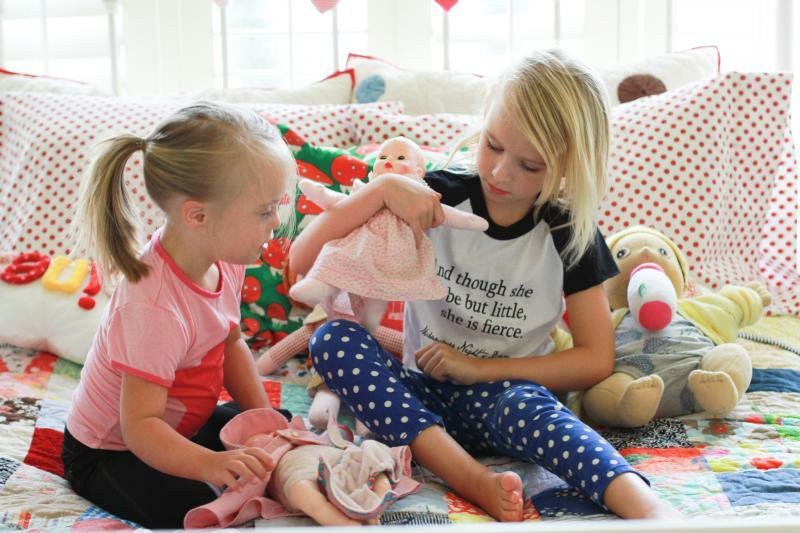 Your two girls are going to have the most amazing childhood memories thanks to their momma! I have two girls as well, ages 5 and 2 and they share a room, but not a bed (yet). I have to get passed the ‘if one is sick during the night and throws up all over her sister’s head’ fear first! But I love this. And I’m getting a quilt made as well thanks to your idea!! Not only do you inspire your family, you inspire all of us as well! oh my goodness – i love this! looks so great, kelle! It’s perfect Kelle. 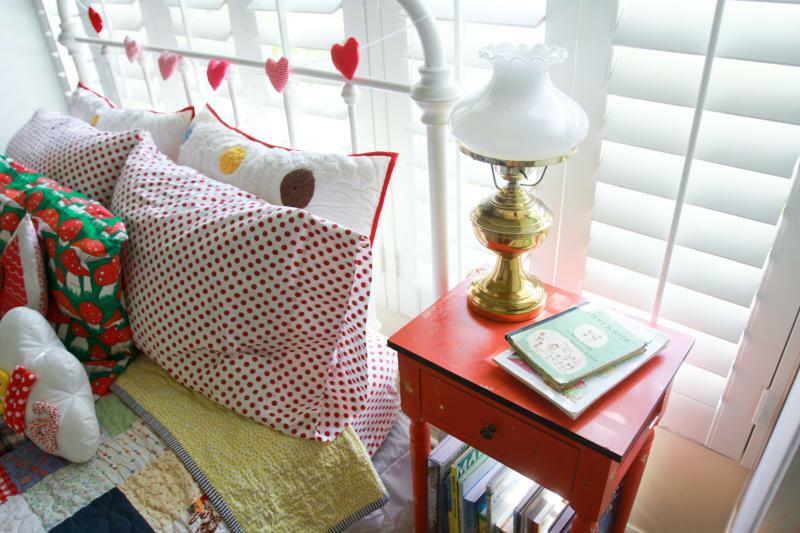 Love the quilt and those funky pillows. The bunting is the icing on the cake. I’d never want to leave. How blessed are they!! What a beautiful room! 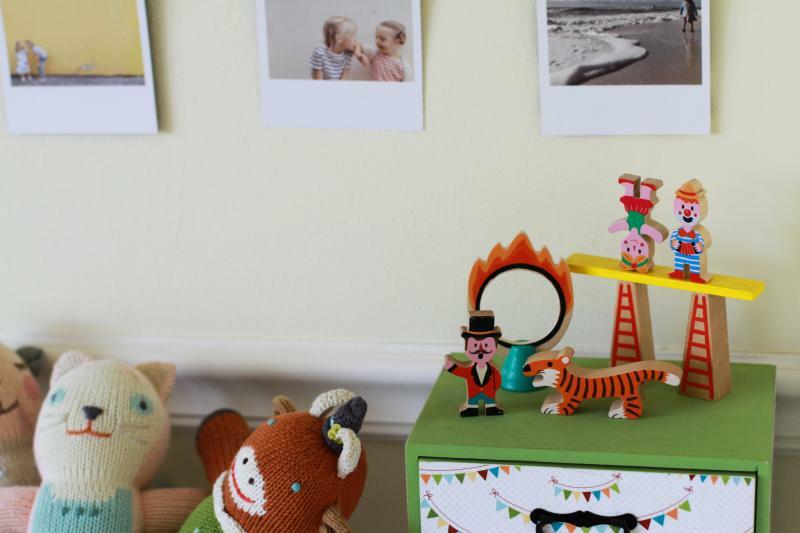 Would you mind sharing where the knitted animal dolls in the basket are from? Such a wonderful room for your girls. My girls are 2 and 4 years old and share a room but they share the ikea kura bed. My youngest seems to want to sleep up top with big sis but they sleep just fine together in the spare room in the full sized bed occasionally. I always had my own room growing up so I don’t have personal experience with sharing a bed. How was it for you and your sister as you got older? How long did you share? I think it’d be a great idea to look into getting my girls a full sized bed to share instead of bunks. Great post Kelle! See, this is why I follow your blog. You understand! Siblings to me means bunk beds. I’ve been wanting my boys to share a room for quite a while, even bought twin beds (that convert to bunk beds, of course) and put them together in one room, and haven’t had the guts to make the transition yet. Does “special needs” do that to me or am I “doing that” to “special needs?” *shrug* What happens to a dream deferred? Pretty sure yours just exploded all over those girls’ room, and I’m so proud of you for it! 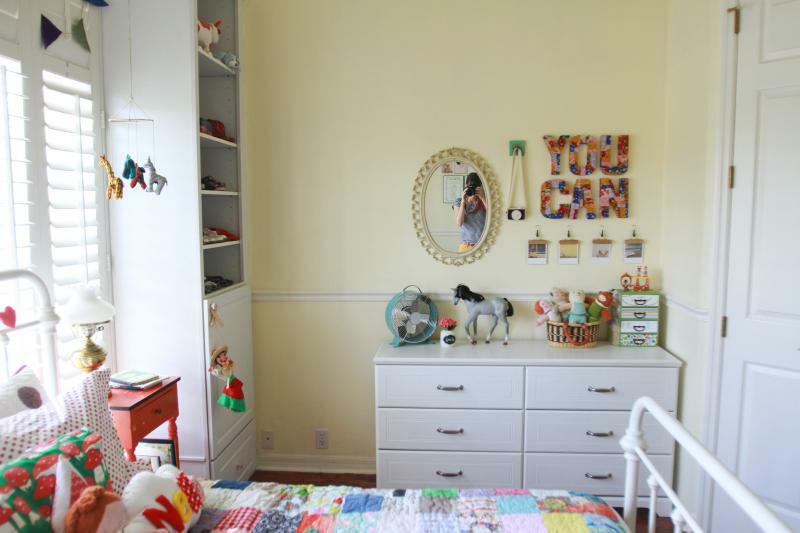 The bedroom is gorgeous – what kids and moms dream about! Nice job. 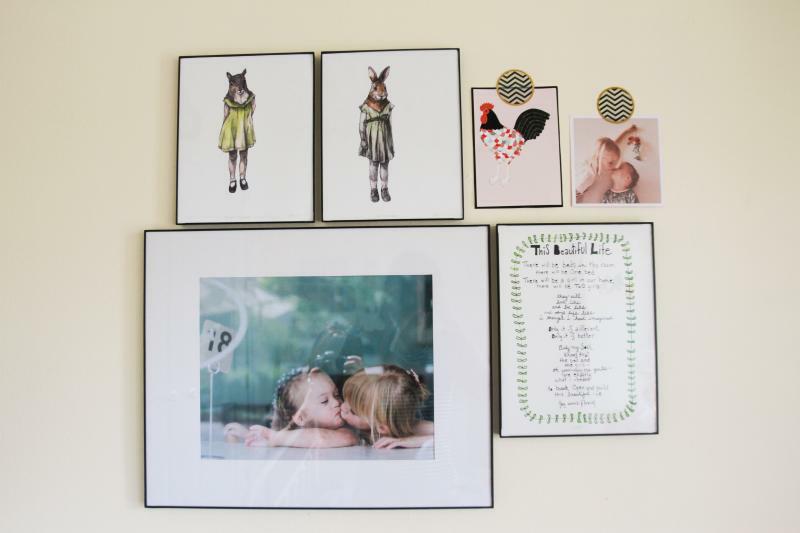 I love the posts you have about your girls’ room. I recently found out that our third kiddo is another girl, so I will have the two girls sharing a room; I think yours are closer in age though. Mine will be 3 3/4 years apart (funny how we divide things! 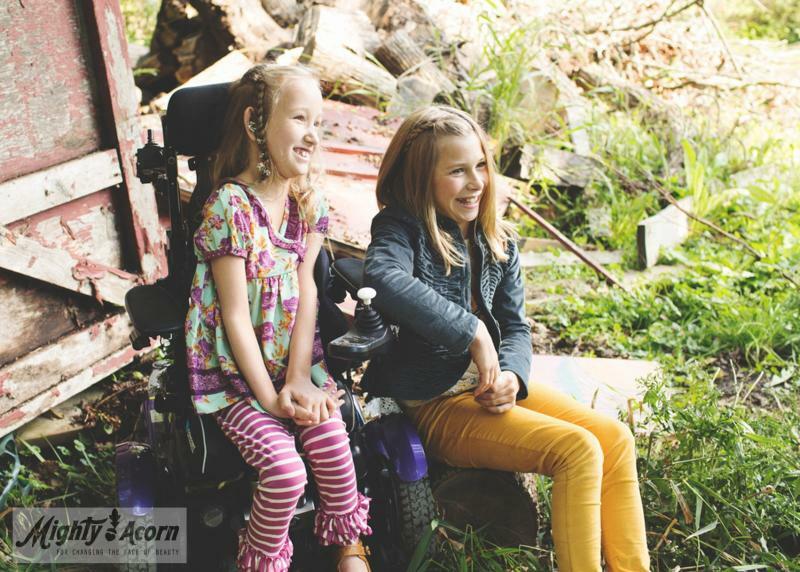 ), and I truly hope they do as well in sharing a room as Lainey and Nella. I had to share a room with my sister but we’re barely a year apart, so it was a very different thing for us. Seeing your girls sharing a room gives me hope and inspiration for how to set things up! Beautiful room! We live in a small house…the boys share a room and the girls will when the baby moves out of ours, but we sometimes think of moving to a larger house. I do not want to give up the sharing though. Despite the fights that sometimes happen, I think it is making great memories for them. And where have I been? They still make records?? I loved a record player growing up. Maybe one will show up under the tree this Christmas. So completely precious! And, that discount bed frame you mentioned goes perfectly with that beautiful quilt; made to go together. 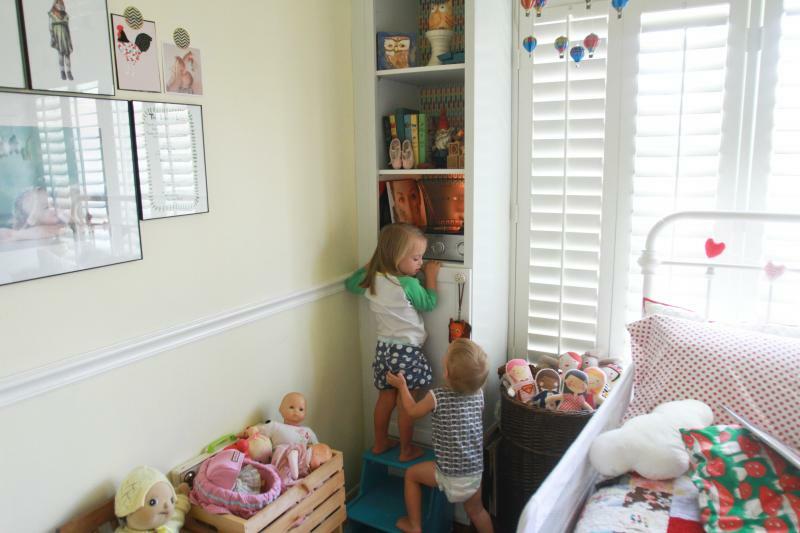 Cute seeing Dash in his sisters’ room with his curious fingers ;)Hope you and yours have a great week! This is lovely! 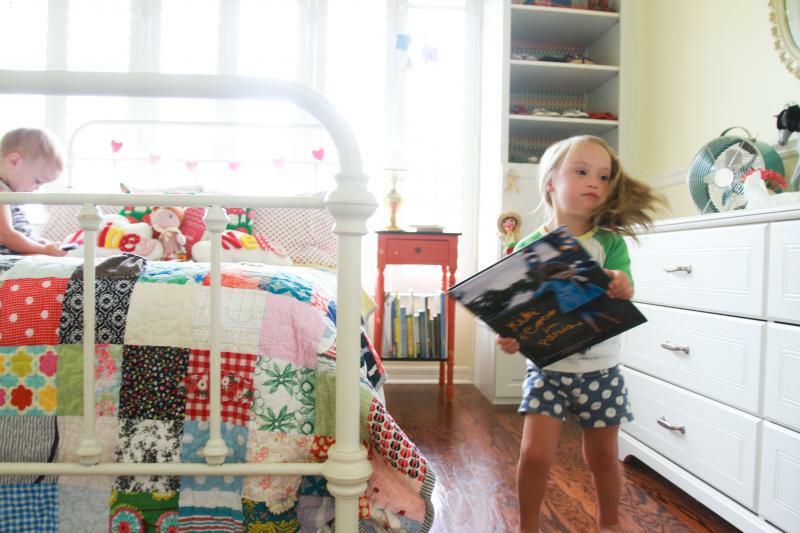 And the quilt in particular is so special. 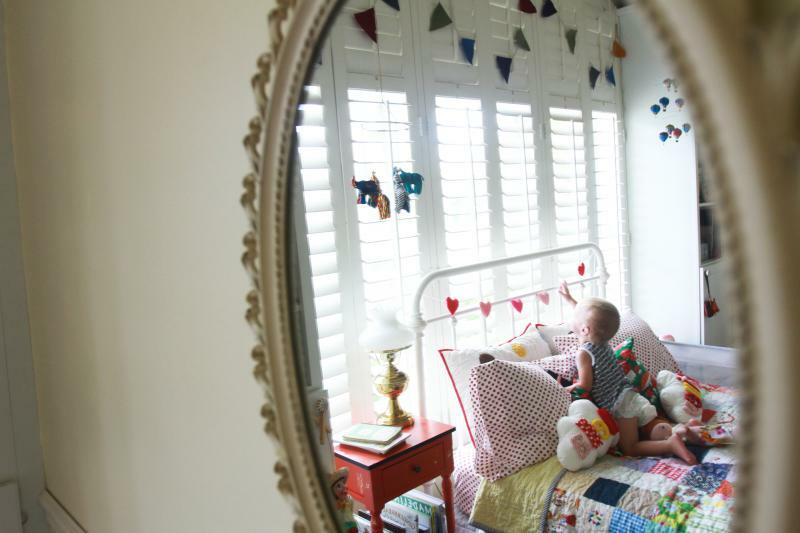 Your whimsical room matches our whimsical family. Love it! We live parallel lives Kelle! I just did this with my girls. They were actually sharing a twin bed because one day my hubby decides to take the crib down because “maddie is 4, why is she still in a crib?!? 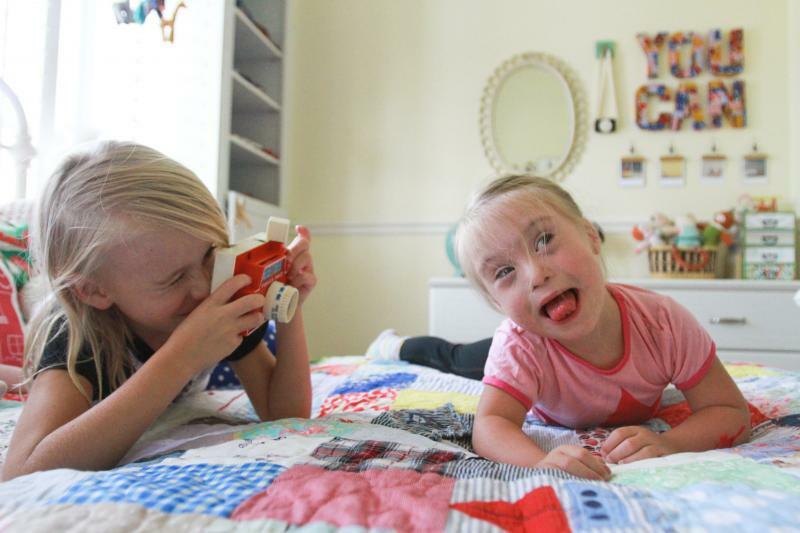 !” Well, we did not have a plan for what we were going to do for beds for the girls so they just started sharing the twin bed. 2 years later we fianlly bought a big bed, painted and finished the room. The memories that are being made in there are amazing. Getting a glimpse of them in there together in the mornings just makes my heart burst. Love it! You are so great at this mommy gig. I shared a bedroom with my sisters growing up. 4 girls, 2 waterbeds, so many fun memories! What a gorgeous blog. Glad I found it. I love this! It looks like they have an amazing relationship! I love the room!! It is so friendly and inviting!!! The quilt is just A-MAZING!!! I clicked over and read your post about it. Tears began pouring as I read about the gown and the “dark hospital room”. I know, there is no other time, place, or event that can compare. I will be getting one of these quilts made. I have a closet bursting with my kids things that I can’t imagine getting rid of!! Thank you for the wonderful idea!!! Hugs from Oklahoma! I know I am late to this entry but it really hit home with me. My two girls share a bed and have for years and they are 14 and 11. They love being together and usually look like two puppies curled up together. When we bought a loft bed last year I thought that for sure they would sleep separate but they don’t. Beautiful, happy room. May I ask, where are your art frames from? I have been looking for thin frames for awhile now.